"Staff across the service need to understand the little decisions that affect the big numbers." Across any council’s services, dozens of teams and hundreds of staff make thousands of individual decisions every day. For councils involved in change programmes, even seemingly small decisions are crucial. The success or failure of change efforts is largely determined by how management decisions are translated into real-life practice on the front line where the services are actually delivered. It is these everyday choices made by staff which cumulatively impact on outcomes for citizens and on the council’s finances. With so many decisions involved, how can everyone – frontline staff, social workers, managers, finance directors and residents – be satisfied that the right decisions are being made for the service user and for the council? As we and our local government clients have found, there is a significant challenge in managing performance across different services while avoiding micro-managing each interaction and creating a huge managerial bureaucracy. IMPOWER’s answer to this challenge is Primed Performance Management. What is Primed Performance Management? How is it different from traditional performance management approaches? What was the impact in Ealing? Through active Primed Performance Management, teams develop a performance culture. 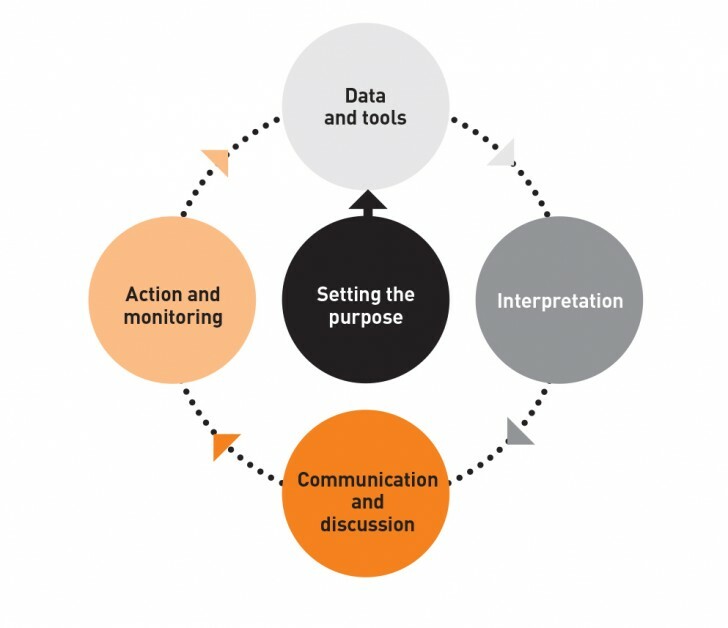 They gather and use performance information as a day-to-day activity, which enables everyone across the organisation to understand how individual actions and decisions impact the system as a whole. To do this, teams use a Primed Performance Management framework for making decisions, shaping behaviours and agreeing principles. Using timely and accurate performance information alongside the adoption of a structured meeting process and embedding of the right behaviours enables fact-based decision making. Staff are then able to interpret data and act on it. We use the word ‘primed’ because our approach resolves the inherent tension between the managerial need to record, monitor and measure activity, and the values that drive the commitment and behaviour of front-line staff. We create an environment where all stakeholders are ‘primed’ to achieve a coherent goal with energy and purpose. Provides a wealth of information to make informed decisions about running the department: Which teams need more or less support? Which activities are having an impact on the front line? Where is the money going? Enables a management team to take direct action to achieve its goals – whether they are financial, outcome-focused or related to improving quality. Understanding its own performance enhances an organisation’s capability to work across interfaces – between departments in the same organisation, with partners, and with the people who use services. Designing and implementing a Primed Performance Management framework is a highly collaborative process, the primary focus of which is getting the right behaviours in place at all levels of the organisation to embed a performance culture. We start by directly observing teams to understand what management data and other information exists to inform decision-making, identify the behaviours that the management team displays, understand what works and what doesn’t, and spot any obvious gaps. From there, we work with the teams to redesign meeting structures, management data, actions and communications to improve impact. We start by understanding what is currently happening. We observe and analyse the available data, the meetings that already occur, how they are run, how decisions are made, and how subsequent actions are captured, implemented and monitored. At the conclusion of this stage we will produce a review of the current situation and identify what is working well and what needs to be developed. A wide range of stakeholders from the Finance Directorate to social workers from across the council are involved in designing the principles. Local co-design is vital, as each council is different, with its own unique challenges, cultures and ways of working. One size does not fit all. It is important that the principles cover both managerial and values-based needs. At the end of this stage, a draft framework design is signed off ready for piloting. 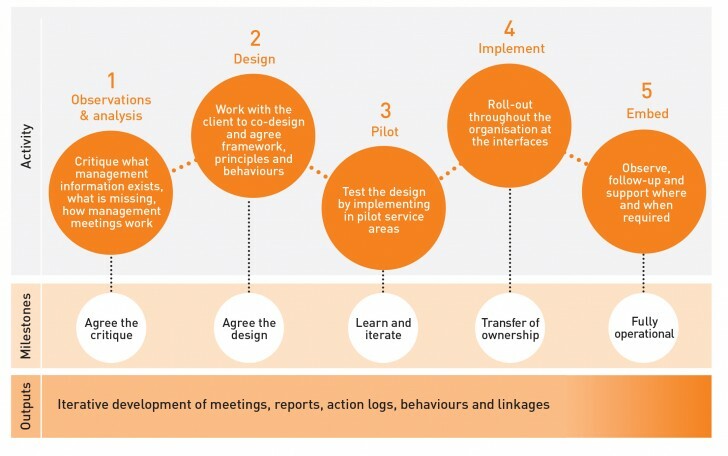 Most importantly, modelling the behaviours we expect to see in meetings, which are primarily about engaging with the information, taking decisions based on the data, agreeing actions and delivering and monitoring them Any issues with the design can be ironed out during this phase and re-tested before being rolled out. At the end of this stage the draft framework is finalised. Working with each team in turn, we explain how the co-produced Primed Performance Management system works and describe the new reports and structure, coach the team manager in using the data and support them in embedding the behaviours at team meetings. This is the most time consuming and intensive stage of work – and the most rewarding for the council staff, as they start to see how individual actions and decisions impact the system as a whole. We monitor teams’ progress and support them until they reach the point where they no longer need our formal support. Depending on staff skills, experience and willingness to engage, this might happen after a few cycles of reports and meetings, but it could require more time. This stage also includes transferring the ownership of Primed Performance Management as the approach becomes simply ‘business as usual’. In practice, this occurs when reports start being produced in-house (rather than with IMPOWER’s support) and training of council staff is conducted by their colleagues. In this final stage we look across the organisation and provide light-touch support to any teams or individuals who need additional help. We help refine reports if required and make final adjustments to agendas and terms of reference. Once everyone is confident that they have a sustainable framework in place, we step away completely. IMPOWER worked with the London Borough of Ealing to transform adult social care between April 2017 and March 2019. Using a strengths-based approach, social workers successfully increased the independence of service users. This improved outcomes for the people of Ealing while reducing costs. Delivering the implementation phase of Ealing’s ‘Better Lives’ adult social care transformation programme. Observing and analysing a range of team and management meetings to understand current structures, operations and behaviours. Working with staff and stakeholders across the Council to co-design a bespoke set of reports and tools to support staff in achieving the service’s ambition, including clear terms of reference for meetings. Piloting the approach with select teams to ensure the approach worked for Ealing. Implementing the new approach across the whole Better Lives programme. In doing so, we changed staff behaviours and developed their skills to better analyse, communicate and act on the new information. Continuing to provide support to teams as Primed Performance was embedded. 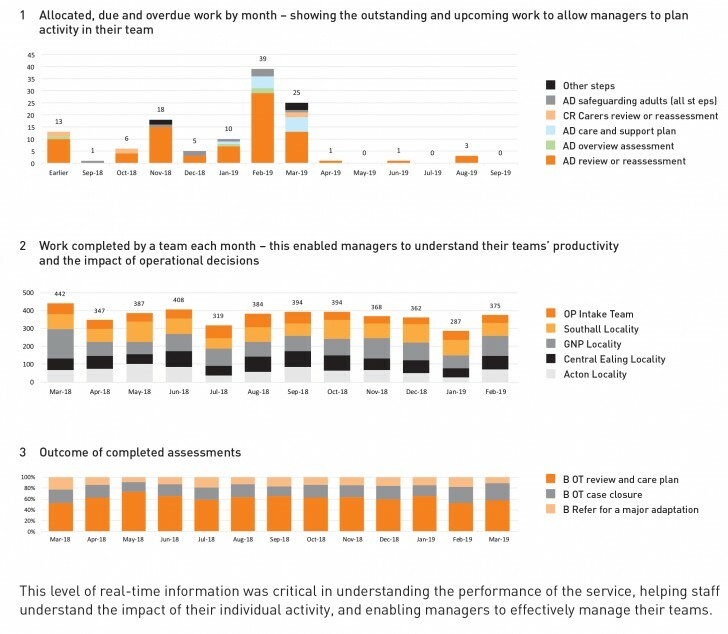 With each report, our aim was to provide something that was easy to understand and analyse, and could therefore help managers make decisions and see the impact they were having. Generating the data needed represents only a small proportion of the work. More than 80% of the project time was focused on people and behaviours, not numbers. Change takes time –some managers and teams will get it straight away, but others need much more support. This can mean three or four months of coaching to get it right. It helps to start early – the sooner behaviours are embedded, the sooner management teams can start to deliver their objectives. It is critical that there is truly ‘one team’. Finance and performance colleagues need to work alongside front-line social workers and service managers, towards a shared goal. The information, data and impact must come together so that there is only ever one version of the truth. Alongside the reports we established a Primed Performance Cycle for each team. We worked side-by-side with team managers, repeating the cycle, until they were comfortable with analysing, communicating and acting on data. Before starting the cycle, we made sure that the service as a whole, and then individual teams, were clear about their purpose. What were the objectives at a service, team and individual level, and what were the targets everyone was working towards? We then ensured that each team had the right data and tools. All data came from the same source, but reports were tailored depending on the activity within a team. For example, the contact centre data focussed on the number of referrals they were producing and their outcomes, whilst a social work team would focus on the number and outcome of assessments and reviews. We worked with team managers to develop their skills in interpreting data – providing them with templates and prompt sheets of questions, and then working through these to build their confidence. Communication is the area that is often overlooked during change processes, and required significant input. The ability to talk simply, confidently and clearly about data is not a given, so we worked with managers to find the best way for them to get information across to their teams in a way that made sense to them. All of this work would have been pointless if no action resulted from it. Initially, we found that rich discussions were taking place in team meetings but that these were not translating into action. We therefore prioritised making sure that team meetings concluded with clear actions, owners and deadlines, and that these were followed up. We repeated this cycle with team managers until they were comfortable with it and it became business as usual – a sustainable mechanism for performance managing the service. As a result of this, Ealing Council benefitted from impressive operational and financial outcomes – see below. The adult social care management team now have a structured approach to understanding what is happening across the service. This has enabled them to make more informed decisions about running the department, based on a detailed understanding of what is happening on the front line.